I want to start this survey of Radio 4's Sunday (as you have to start somewhere) with a series of posts discussing its treatment of Roman Catholicism, as some might see the programme's ongoing focus on 'bad news' stories for the Vatican as a sign of BBC anti-Catholicism. I would say at the outset that it is clearly no such thing. It seems to me, if anything, to be evidence of bias in favour of liberal Catholicism. I'm not the first person to believe this. Holy Smoke blogger, Daily Telegraph columnist and - crucially for this post - former editor of The Catholic Herald, Damian Thompson, wrote a piece nearly two years ago entitled Ed Stourton reveals his liberal Catholic bias again as he puts the boot into the Ordinariate. Damian wrote "Radio 4's Sunday programme offers perhaps the most undiluted liberal bias to be found anywhere on the BBC...Yesterday's discussion of the Ordinariate was introduced by Ed Stourton, whose interviews with his fellow liberal Catholics often sound as if they were taped at a meeting of the board of the Tablet (on which he sits). This was no exception." Edward Stourton is indeed a trustee of The Tablet, along with the likes of Lord Chris Patten, Baroness Shirley Williams and Baroness Helena Kennedy (as fine a collection of the liberal 'great and the good' as you could hope to gather together on a board). 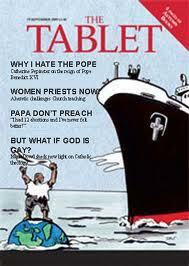 The Tablet is a liberal Catholic magazine, broadly centre-left politically, liable to be critical of conservative trends within the Church - and of Pope Benedict XVI's Vatican in particular. I'm painting in fairly broad strokes but not, I think, inaccurately, by comparing it to the Guardian newspaper. Its rival is The Catholic Herald, rather more conservative, somewhat more right-leaning politically, less regularly critical of the Vatican, more akin to the Daily Telegraph. A read of Damian Thompson's blog, with its occasional digs at 'Tabletistas' (think 'Sandinistas' and 'Guardianistas'), shows that there's a fair gulf of attitude between them. Here's the first evidence of bias. I think it is quite revealing that, throughout the 22 months of my survey (Jan 2011-now), Sunday has not featured Damian Thompson, former editor of The Catholic Herald, or Luke Coppen, its present editor. Nor has it interviewed any of the other regulars at The Catholic Herald. Indeed, and this might strike you as remarkable, I have not heard a single mention of The Catholic Herald on the programme throughout that time - and I have listened very closely to every episode. What though of The Tablet? How has it fared on the show whose main presenter is one of its trustees? Have their been any guests from The Tablet appearing on Sunday? Its editor, Catherine Pepinster, has appeared on three editions during the time-frame of my survey (25/3/2012, 15/1/2012, 28/8/2011). You may know her from her frequent appearances on Today's Thought For The Day. [She is the second most regular of the Catholic speakers on TFTD, behind fellow Tabletista Clifford Longley]. Fans (like me) of the Platitude Of The Day website will know that she is the holder of the prestigious Platitude Of The Year award 2011. Even more conspicuous has been Robert Mickens, Vatican correspondent of The Tablet. Robert is immediately recognisable by the ironic tone he uses to dish the dirt on the Vatican. He has appeared on six edition of the programme during my survey period (16/9/2012, 9/9/2012, 3/6/2012, 12/2/2012, 5/2/2012, 1/5/2011). As I shall expand upon later, the irony-tinted Mr. Mickens was treated as if he were a friendly BBC colleague on the occasions Ed Stourton chatted with him (supporting Damian Thompson's characterisation of Sunday as quoted above). "Stourton was chatting with one of the Sunday programme's favourite Catholic commentators, Dr Tina Beattie, a straight-from-central-casting 1970s feminist (and director of the Tablet, according to the website of Roehampton University)." Tina Beattie is, indeed, a regular Tablet columnist. She's been invited on four times over the period in question (14/10/2012, 9/9/2012, 1/5/2011, 30/1/2011). And on it goes...The man who, as editor, steered The Tablet leftwards, John Wilkins, has also been invited onto Sunday over this period. He was there for two of the big Sunday specials - those (alongside Tina Beattie) for the 50th anniversary of Vatican II (14/10/2012) and (also alongside Tina Beattie and Robert Mickens) for the beatification of Pope John Paul II (1/5/2011). Since first writing that paragraph, I've discovered that it's even worse than I thought. I'd assumed that the Christopher Lamb sent to report on the feelings of ordinary Catholics during the Vatican II edition was a BBC reporter. He had also been dispatched by Sunday to interview Catherine Tate about the King James Bible (23/10/2011). He's just reappeared, however, on the 28/10/2012 edition where he has been introduced, for the first time, as "The Tablet's Christopher Lamb" - and indeed he is. Curiouser and curiouser. "From the strictly impartial BBC Sunday programme at Cofton Park, a classic discussion of the subject of women priests between Tablet editorial consultant Clifford Longley, Tablet director Tina Beattie and the Tablet's favourite bishop, Kieran Conry of Arundel and Brighton – chaired by Tablet trustee Ed Stourton." To all this we may add that Ed himself isn't just a BBC presenter and a Tablet trustee, he also pens occasional pieces for The Tablet. His BBC colleague, David Willey - who treads a fairly similar beat to Robert Mickens in Rome and is a regular contributor to Sunday - is also a frequent writer for The Tablet. So if you don't get Robert reporting from The Tablet from the Vatican on Sunday you are likely to get his fellow Tablet scribbler (and BBC veteran) David Willey . Doesn't this get ever more extraordinary? And on it goes...when Tabletista bogeyman Pope Benedict visited Germany, Sunday (25/9/2011) invited on Christa Pongratz-Lippitt of...The Tablet [duly mentioned] to give her less than wholly enthusiastic appraisal of the visit. Sometimes no one from The Tablet even needs to appear for it to get a mention. Here's Jane Little (17/7/2012) raising the issue of donations from Rupert Murdoch to the Catholic Church: "The Catholic Weekly, The Tablet, has called on the Church to give the money back. Should it?" The issue was discussed with the man Damian Thompson called "the Tablet's favourite bishop", Kieran Conry of Arundel and Brighton, and a chap from the left-leaning think tank the IPPR, Labour advisor Francis Davis of the Guardian - who also, it transpires, writes articles for The Tablet...and talking of Rupert, when The News of the World was shut down (10/7/2011) Clifford Longley [editorial consultant] "of the Tablet" was on hand to give his view. Sometimes a guest can appear whose presence on the programme appears puzzling. Why discuss the film The Rite with Fr Christopher Jamison? As the film is about exorcism, perhaps that's explanation enough, given that Catholic priests are popularly associated with the practice. Except...why this particular Catholic priest? Well, Father Christopher Jamison just happens to write for The Tablet. Even one of the most regular Jewish guests, Ed Kessler, who received four invitations (9/1/2011, 6/3/2011, 1/5/2011, 11/12/2011), writes for The Tablet. In his last appearance (so far), late last year, he was sympathetic to Pope Benedict [having engineered a historic meeting between the Pope and the Chief Rabbi] and has never appeared on the programme since. He has continued to write for The Tablet though, so he could be invited back in time. That's a lot of Tablets to swallow! You may not care very much about turf battles between Catholic magazines or, for that matter, about tussles between opposing wings of the Roman Catholic Church, but do you not agree that the rather relentless-seeming promotion of the liberal Catholic Tablet at the expense of the more conservative Catholic Herald cries out for an explanation? It seems highly biased, does it not? Well done thank you for this, I have put a link on my blog. Thank you Fr Ray. Much appreciated. I have contacted the Sunday Programme pointing out their editorial bias, and asking whether they intend to be more evenhanded in the future. I hope many more do the same. Good. Get this 'out there' boys and girls. We're fed up with the lot of 'em. and fed up with them living off Peter's pence too. An on-line complaint of bias to the BBC complaint site only took a couple of minutes. I hope others will do the same. That the Tablet shows bias is one thing. After all no one need buy it and in my part of the Catholic world, few do. That the BBC should be party to such biased and collusive comment and reporting is another matter. After all we Catholics pay our license fee like anyone else and expect objective analytical reporting on Catholic or indeed on any other matters, and we are not getting it. So a formal complaint to the BBC is in order. although a copy to shall we say Jeremy Hunt the Culture Secretary would perhaps provoke a few questions? Is that a genuine Tablet cover at the top of the article? Until it's confirmed, I'll charitably assume it's an OTT fake! John Lagrue, I appreciate the value of your camparison, but I take it you are being ironic by calling it a "heavyweight organ" with "intellectual power". ...some might see the programme's ongoing focus on 'bad news' stories for the Vatican as a sign of BBC anti-Catholicism. I would say at the outset that it is clearly no such thing. It seems to me, if anything, to be evidence of bias in favour of liberal Catholicism. Same thing, really. Excellent work, Craig. The two most-featured Catholic voices on TFTY are from the same liberal publication? What a shock. Thanks David. Yep, it's a jaw-dropper, isn't it? !